In recent years, people have started to take animal welfare very seriously and slowly we are starting to see a change in the way that animals are treated. But what first springs to mind as a feasible idea to improve the lives of animals destined for human consumption? Bigger roaming areas? Free range? The Matrix? Wait… What? An assistant professor in design at Iowa State University, Austin Stewart, has released ideas for a project named “Second Livestock” which involves tricking chickens into thinking that they are free range, while they are actually contained within small enclosures. This would be achieved by strapping virtual reality headsets onto farmed chickens (stop laughing). These “Cockulus Rift” headsets would therefore make the chickens believe that they are in a nicer, less stressful environment (really, try to stop laughing). Image Credit: Second Livestock. 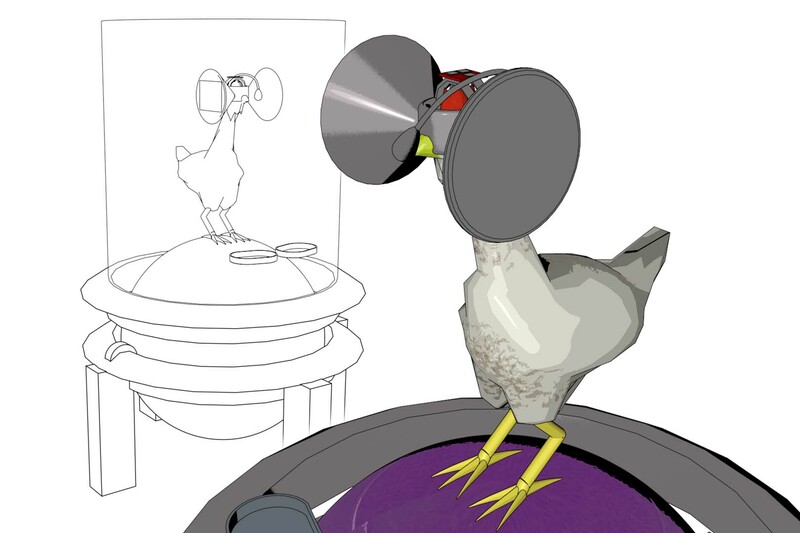 Technical rendering of chicken-computer interface. Is this a big joke? Well, kind of, but not necessarily a futile one. Stewart created this project in order to spur people into talking about animal welfare, and also as a kind of experiment to look at our relationship with technology, and of course to see how many people would actually believe that researchers intend on doing this. That being said, he told Techcrunch that he would be willing to work with anyone who is willing to offer their services to make it happen.